This homemade hamburger helper tastes even better than the original and uses only real food ingredients! In under 30 minutes, you can have a totally gluten free and dairy free meal the whole family will love! As a mom, I absolutely ADORE one pot (or skillet) meals! They are convenient and super easy to clean up. And let’s be honest…we could all use a little more easy in our live….am I right?! As a child, I loved all the variations of Hamburger Helper...but today the frightening ingredient list means even withOUT allergies, I would not choose to feed those boxes of processed nastiness to my family. 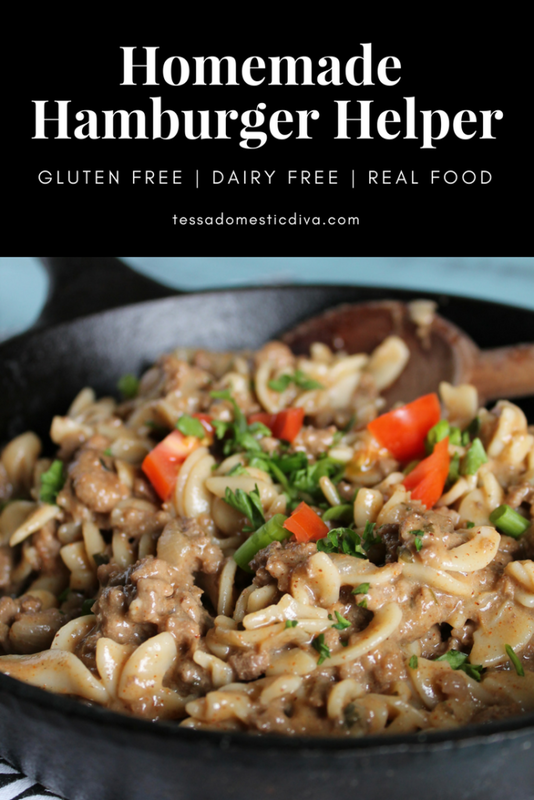 Hamburger Helper Ingredients and why you should avoid it too!! I mean, where even to begin with this list of garbage ingredients?! The wheat, corn, soy, and sugar ingredients are undoubtedly GMO, meaning plenty of Round Up residue to go with your hamburger. No thanks! MSG (monsodium glutamate) is a chemical added to food to ‘enhance’ its flavor. Lots of people have adverse reactions to it….steer clear of things made in a lab! Food dyes?!! I am hard pressed to figure out why any sort of additional chemical coloring is necessary in ANY food. Gross. Sulfites – another one that acts as a preservative so the food can last for ions on the store shelves. A lot of people have sensitivities to it, PASS. So how to make this a REAL FOOD meal? Come with me, and I will show you an easy way to make every kiddo happy with a yummy 30 minute dinner! 2 teaspoons tomato paste for extra umami = flavor, optional, my husband and I added hot chili sauce as well. 1 1/2 cup milk (Use unsweetened; coconut or almond are my favorites. 2 1/3 cups gluten free noodles I use Trader Joes Brown Rice Spirals, or Tinkiyada. Preheat a large skillet with a tight fitting lid over medium heat (my cast iron pan is my absolute favorite and what I use 99% of the time for all my stove top cooking!). I LOVE that you have “real foodified” this recipe! I’m sure this will be a favorite in so many homes, especially for those of us who grew up in the 80’s when the boxed stuff was so popular. Super yummy! Tessa way to go!! your recipes are amazing!! my kids are PICKY eaters and this recipe was nutritious and eliciuos! Thanks Jennifer! So glad even the picky kiddos went for it, huge mom win! Made this tonight and it was so good! It made enough for two meals for myself and my husband. I used rice noodles, coconut milk, organic beef and omitted the Worcestershire sauce, cheese and paprika due to allergies. It was still awesome. Thanks for sharing! So glad you enjoyed it! Thanks for sharing your tweaks! So appreciate the feedback! Thank you so much for this amazing recipe. I’m lactose intolerant and enjoy healthy foods; finding this dairy-free gem made my day! I used organic beef and brown rice noodles, but I opted to skip the cheese (cheeze) as I wasn’t in the mood for a dish that rich. I did add a little nutritional yeast when the food was on my plate though to give it that salty, cheesy flavour. Thanks again – 5-star recipe and very simple to make. It’s pure comfort food Leanne! Thank you so much for letting me know how it worked out for you! My good friend brought over this for a dinner after my daughter was born, and everybody loved it. I making it regularly ever since. Hi Mark! Under the last picture, I provide a text link to the recipe….this was a guest post! 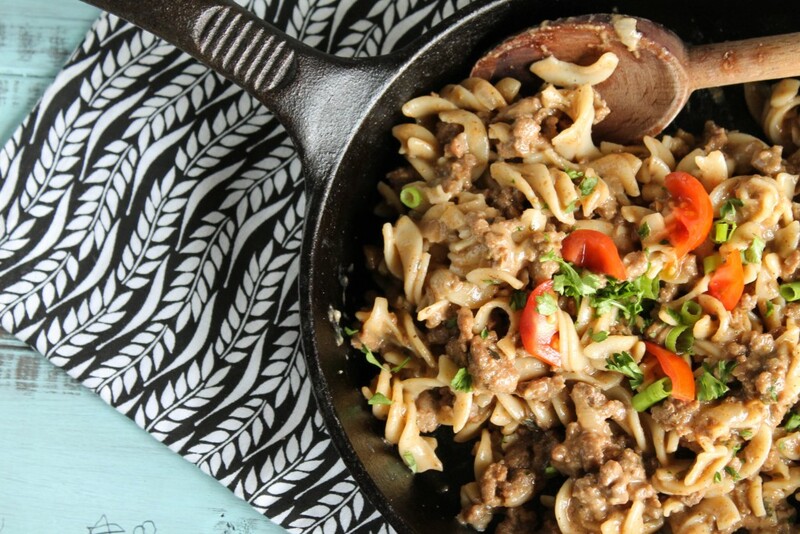 Hamburger helper gone all-natural? Sign me up! This brings back memories of childhood with five hungry kids racing to the table. Thanks for such a delicious-looking recipe! Tried this out on the weekend. Perfect Sunday meal and now I have leftovers for the week (which I’m excited about)! Great flavour, very easy to make. My noodles suggested 7-10 minutes of cooking time but some how the 15 minute cooking time worked out in the recipe. Thank you! 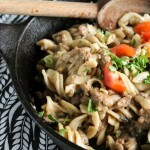 I love one-pot meals too, they are a life-saver for moms! Thanks for sharing this at Savoring Saturdays, Tessa – it looks and sounds delicious! 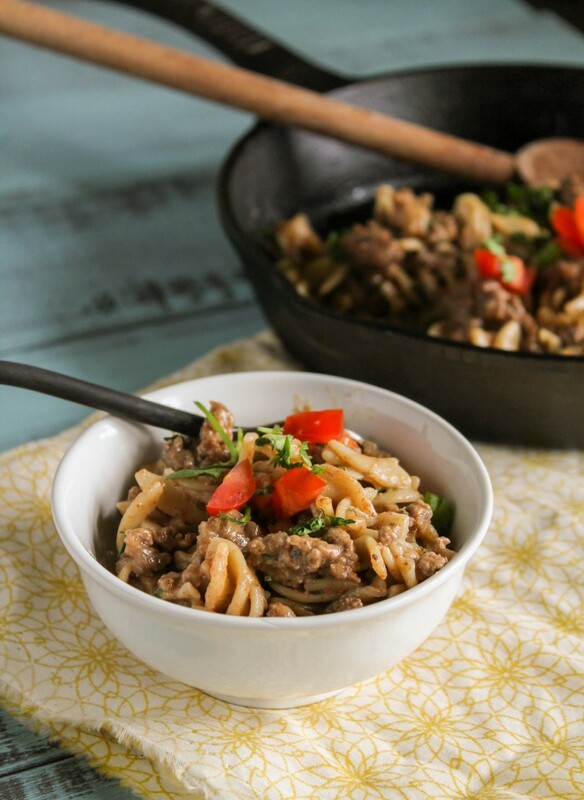 Your Homemade Hamburger Helper Beef noodle Skillet looks delicious,(and so much better than the box). Hope you had a great weekend and thank you so much for sharing your awesome recipe with Full Plate Thursday. Have a good week and come back soon! Cassidy @ Cassidy’s Craveable Creations recently posted…Paleo Chocolate Buttercream Frosting & A Giveaway!!! Thanks Cassidy, hope you love this one too!